In the last three blogs below, I mainly discussed how to query data between BDA and Exadata and a way to load data from BDA to Exadata using OLH. 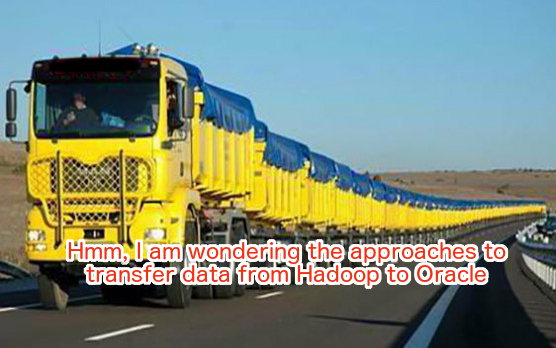 When moving data from Oracle Database to Hadoop, I discussed the approach using Sqoop in this blog. There is actually another better approach on BDA by using Copy to BDA. Copy to BDA allows you to copy tables from an Oracle database into Hadoop in the format of regular Oracle Data Pump format, dmp file. After generating Data Pump format files from the tables and copying the files to HDFS, you can use Hive to query the data locally without accessing remote Oracle database on Exadata. Ok, here is the overview of my plan to do the work. I am going to use the same Oracle table, ORA_TARGET_STOCK_PRICE1, used in my last blog on Exadata to generate an Oracle Data Pump dmp file. Then copy the Data Pump format file to the BDA and load it into HDFS. After the dmp file is available on HDFS, link the dmp file to a Hive external table. Then you can query the Oracle Data Pump file directly by using Hive on BDA. Ok, I can get the result from ora dump file in Hive. Nice feature. In my test, I use only one dmp file. You actually can generate multiple dmp files to speed up the export of dmp file as well as faster data access on Hadoop. The syntax to use multiple dmp files is like LOCATION(‘file1.dmp, file2.dmp’). This feature is quite useful when you want to reuse the same Oracle dmp file on both sides. For example, you can use the dmp file on HDFS to query data directly on BDA without connecting to Oracle database on Exadata. At the same time, if you want to reuse the same data on Exadata, you could easily reimport the same dmp file to Oracle database on Exadata. At the time when the source Oracle table changes, you can regenerate the dmp file on Exadata and then refresh the copy in Hadoop. Copy to BDA is primarily useful for Oracle tables that are relatively static and do not require frequent refreshes. Copy to BDA is licensed under Oracle Big Data SQL and you have to have an Oracle Big Data SQL license before using Copy to BDA feature. In the last two blogs, I show how to query data between the two system: Hive on BDA Oracle on Exadata. Copy the result files to a NFS mount that is visible on both BDA and Exadata. Then use sqlldr or Oracle external table to load the data into Oracle database. There are many articles/blogs about sqlldr and Oracle external tables. I am not going to repeat here. Oracle Loader for Hadoop (OLH). This is the topic I am going to cover in this blog. OLH is part of Oracle Big Data Connectors. It is a MapReduce utility to load data from Hadoop into Oracle Database. It first sorts, partitions, and converts data into Oracle Database formats on the Hadoop cluster. Then it loads the converted data into the database. One of main advantage of OLH is to preprocess the data on the Hadoop side and reduce the CPU and IO utilization on Oracle database. In my test, I am going to reuse the stock_price.csv file from my first blog to load into an Oracle table on Exadata. This time the table is created in a normal way instead of external table. OLH requires a temporary output folder on HDFS. This directory needs to be removed before the data loading. In my example, I am using /user/oracle/oraloadout directory on HDFS. Copyright (c) 2011, 2016, Oracle and/or its affiliates. All rights reserved. 16/11/03 05:04:42 INFO loader.OraLoader: Reduce tasks set to 0 because of no partitioning or sorting. Loading will be done in the map phase. 16/11/03 05:04:43 WARN loader.OraLoader: Sampler is disabled because the number of reduce tasks is less than two. Job will continue without sampled information. In the last post (Data Query between BDA and Exadata (Part 1): Query Hive Table from Oracle on Exadata), I show the way to use Oracle Big Data SQL from Oracle table to access hive table on BDA. In this post, I am going to show the data flow in opposite direction: Query data in an Oracle Table on Exadata from Hive on BDA. On one of DB nodes on Exadata, run the following in SQLPlus. Let’s check out the content in the table. Step 2: Create the script for the external table in Hive. To access data in Oracle table, one way is using Oracle Table Access for Hadoop and Spark (OTA4H). 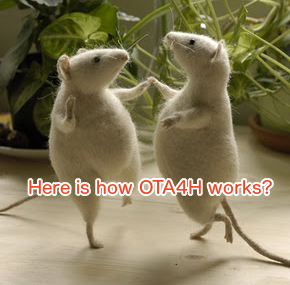 OTA4H is an Oracle BDA feature that converts Oracle tables to Hadoop datasources. It allows direct access to master data in Oracle database using Hive SQL. On BDA node, create a Hive external table. 16/11/02 14:29:29 WARN mapreduce.TableMapReduceUtil: The hbase-prefix-tree module jar containing PrefixTreeCodec is not present. Continuing without it. 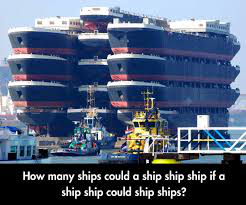 We should see two rows in the result. Ok, the result is exactly what I expect. Last year I wrote several posts showing below to demonstrate load data between Hadoop Hive tables and Oracle tables using Sqoop. To accessing data between Big Data Appliance (BDA) and Exadata, there are a few other approaches that can be used in addition to Sqoop approach. 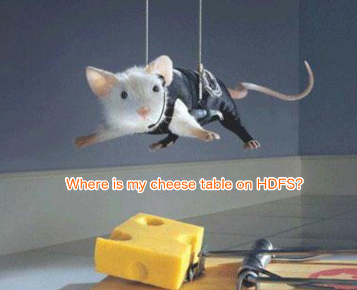 For the next few blogs, I am going to discuss the ways to query hive table from an Oracle table, query Oracle table from Hive on BDA, and load data from BDA to Exadata. Last post, I show the way how to install Big Data SQL on Exadata. In this post, I am going to show how to use Big Data SQL to query a Hive table on BDA from Exadata. Input the following content in the hive_create_stock_price1.hql file. Create the table and verify the result. 16/11/01 15:47:47 WARN mapreduce.TableMapReduceUtil: The hbase-prefix-tree module jar containing PrefixTreeCodec is not present. Continuing without it. Goto another session and logon to one db node on Exadata. Create an external table using type ORACLE_HIVE. Parameter com.oracle.bigdata.cluster refers to the Hadoop cluster name. You might notice the first row is actually the header of the CSV file on HDFS. On HDFS, when I created the hive table, I used a property tblproperties (“skip.header.line.count”=”1”) to skip the header row when showing the result from the hive table. Unfortunately I don’t find a way to allow me to skip header row from Big Data SQL. Anyway, it is not a big deal for me. I just need to remember to remove the header row when loading the data to HDFS.